I’m passionate about botany and I’m passionate about people. Growing up in a farming family in a village close to Ubud, I learnt from a young age about agricultural practices and native plants – and how they are entwined with our culture. My passion for plants led me to Udayana University in Denpasar to undertake a bachelor’s degree in botany and agriculture, and a master’s degree specialising in plant biodiversity. Establishing Ubud Botany Interactive (UBI) in 2014 was the perfect next step for me. Bursting with knowledge about Balinese botanicals, I was keen to share my expertise and passion for plants, farming practices and Balinese culture while benefiting my community. 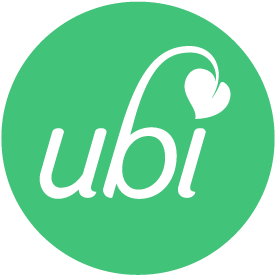 Today UBI is blossoming into a sustainable business that supports the local economy and promotes progressive environmental practices. 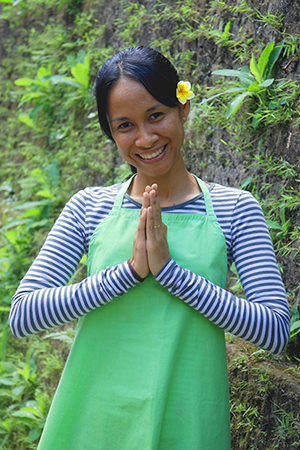 I hope you’ll join me to share my passion for plants and people in Bali. The UBI team consists of Dewi, Dhika and Koming, who all have firsthand experience of Balinese agricultural practices. They love sharing their passion and knowledge of Balinese culture and plants with visitors to the region. If Dewi is unavailable, Koming will run the tours. From the day I opened my studio to share my first workshop with visitors, I have been committed to building a business that supports my community and promotes natural products and sustainable practices. Being an Ubud local, I’m proud to say that in a market dominated by foreign-owned companies, UBI is locally owned – by me! From the hibiscus leaves in my natural body care products to the coconut oil and honey in my shop, every ingredient and product is bought from nearby farmers. As well as generating an income stream for the rural community, the UBI team comes from families who have lived in the region for generations. My walks and tours include visits to my family’s farm and the local temple. I’m passionate about my community and our customs, and love sharing them with visitors. My body care products are chemical-free. They contain natural botanical ingredients and 100% steam-distilled essential oils. All my honeys, oils and teas are produced locally using traditional processes that have minimal impact on the environment. UBI packaging is proudly made from recycled or recyclable glass, plastic and paper.